Get a clue! Bobo got cherrypicking on the brain. The article was specifically about Kivalina. All the chosen evidence supplied was because it had an immediate and direct bearing on Kivalina. It was not an argument about the complexities of global warming, but Booobo is threatened by each and every contradiction, so fabricates an accurately depicted regional issue into another nitwit's devious cherrypicking deception scenario. Bwaaaahahahah! This is what I'm talking about. The article's theme is that someone claimed a connection of their circumstances to global warming. You try to refute their claim using local data. You accuse them of "trying to rekindle global fear". You even bring up old refuted news, like Climategate. Ending with the conclusion that the BBC should never again be trusted to report accurately on any global climate story. When this is pointed out, you say the article is specifically about Kivalina. Who do you think you are fooling? Since I do not expect a objective review of the story, I post the full essay here in a few segments. What the essay does not address, engineers who tried to protect the coastline created barriers that actually blocked the redistribution of sands and gravels accelerating erosion. Guest essay by Jim Steele, Director emeritus Sierra Nevada Field Campus, San Francisco State University. Given the context, such a statement sounds like the locals were feeling abandoned by global warming. But the tone also reminded me of the complaints by many native Arctic people who were relocated by the US, Canadian and Russian governments in a 20th century battle to secure claims to Arctic territory. Such a vulnerable location seemed odd for a permanent settlement.. Sure enough Wikipedia supported my suspicions Kitvalina. The original village was located at the north end of the Kivalina Lagoon but was relocated to its present location in about 1900. Reindeer were brought to the area and some people were trained as reindeer herders, suggesting there as a government attempt to force a permanent settlement. From the history I can glean on the internet “the people of Kivalina, like the Ipiutak before them, utilized the barrier reef only as seasonal hunting grounds, making camp there in warm-weather months.” Their recent plans to relocate due to erosion and an expanding population are opportunistically blamed on global warming. Except, that's not what I said. What I said is, you didn't refute global warming. You tried to refute the claim by refuting global warming. You used local data to try to do that. So you failed. No matter what the data was, you would have failed, because those charts don't inform us of a the global situation. They don't inform of us much at all. What you succeeded at is setting up a situation where no matter what someone says, you'll say they don't understand you, unless of course they just agree with you. They wouldn't know what they are agreeing with, but that doesn't matter to you. Lausten wrote: Except, that's not what I said. What I said is, you didn't refute global warming. You tried to refute the claim by refuting global warming. Lausten why do you insist on fabricating what I said. In the article I never tried to refute global warming as you suggest. The article only refuted the claims that global warming was causing Kivalina's problem. That is a huge difference!!!! Quote where I say otherwise. Indeed at the end of the essay I question why Kivalina is being used as evidence of global warming. But again that is not refuting global warming, And I never have argued the world has not warmed since the Little Ice Age. I do challenge claims that it is all due to CO2. But that is not discussed at all in the essay. I don't expect you to see past your transparent hate for me and my skeptical beliefs. Is your non-stop venomous personal attacks and fabrications of what I actually said due to your anger over my custom title "Consensus is not evidence"??? My 2013 analyses of a forceful resettlement has been corroborated by many sources. The natives knew that barrier island was not to be trusted as a permanent village. But as has been reported.. But instead of seeing Kivalina's demise as evidence an ill-advised forced re-settlement, the media pushes global warming and the alarmists embrace that foolishness. Last edited by Jim Steele on Wed Feb 07, 2018 4:20 pm, edited 1 time in total. Jim Steele wrote: What the essay does not address, engineers who tried to protect the coastline created barriers that actually blocked the redistribution of sands and gravels accelerating erosion. .......and "why" were the engineers trying to protect the coastline? Coincidence....on the tube right now, segment on how China and Russia are developing a new "Silk Road" using the ice free over the North Pole route. Gee....I hope this doesn't stimulate even more pictures from Bad Jimbo regarding snow globes. Why is it “opportunistic”. And where is your data that their population is expanding? Using short term local data (that's questionable anyway) to refute the long term global trend. Adding an emotional plea and using an inaccurate statement. Sackur’s reference to “slowly rising sea levels” are also questionable. Go to the Permanent Service for Mean Sea Level website and view the 2 stations nearest to Kivalina. At Nome Alaska the sea level is rising so slow it appears to be dropping over the last decade. Or look at Prudhoe Bay . Except for a brief surge for a few months in late 2013, Prudhoe Bay sea level has been dropping there as well. 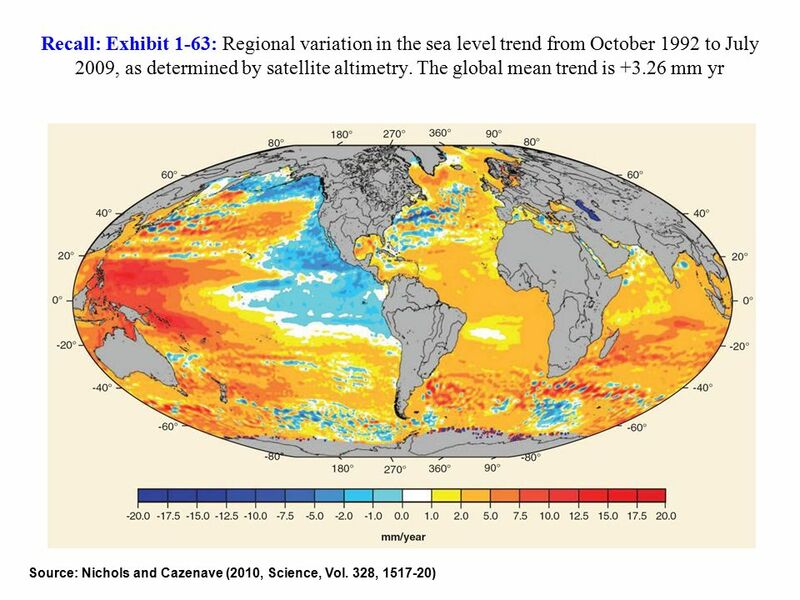 The shifting PDO is also known to change sea level across the Pacific Ocean. I didn't argue that, so I'm no fool. That is such a STUPID thing to say, I actually am surprised. I think you are losing your touch. Local conditions is cherry picking BY DEFINITION. The analogy if you were home schooled is: You have an entire Cherry Tree but you appreciate it only for the Cherries you pick. When you pick something less than the whole, you are Cherry Picking. When it comes to facially retarded arguments such as you use, it has the added element of being the part of the whole that supports your position and ignoring the rest of the whole that does not. This is what you do: ALL THE TIME LIKE RIGHT NOW. Global warming does NOT MEAN everywhere the earth and oceans respond similarly. Everywhere is responding differently. Some areas the sea level goes up, in other areas it goes down. In some areas it gets colder, in others it gets warmer. Its not until you STOP CHERRY PICKING and consider the WHOLE SYSTEM that what is happening can be appreciated: AGW. The fact that YOU have any presence at all in the literature (google) is quite depressing............if you weren't such a joke. That is such a STUPID thing to say, I actually am surprised. I think you are losing your touch. Local conditions is cherry picking BY DEFINITION. ROTFLMAO Boobo you use the phrase "cherrypicking" to deflect every piece of contrary information and now you make up your own definition to suits your beliefs. When only select evidence is presented in order to persuade the audience to accept a position, and evidence that would go against the position is withheld. The stronger the withheld evidence, the more fallacious the argument. It is cherry picking when one pushes only a single "global statistic" and ignores all the local evidence, evidence of dynamics that exert the actual forces of change. The BBC author by definition cherry picked "select evidence, presented in order to persuade the audience to accept a position" that climate change was the cause of Kivalina's problems. And I clearly showed that was bunk! The more Boobo denies or tries to withhold evidence the more fallacious his arguments! Did you read the article with evidence you left out? You have talked about nothing but sea level for two days. Ha, ha..................as stated before, even "if" all your conclusions turn out to be correct, your arguments go past retarded. I do honestly wonder who buys into your BS. Ahem: the single global statistic IS MADE UP OF ALL THE LOCAL EVIDENCE. Its the very opposite of ignored. The VERY OPPOSITE of cherry picking. ROTFLMO. Like a Geiger counter, the closer I am to the truth the more rapid Boobo's insults become, and the more devoid of science. The reason I, and I suppose Bobbo too or anyone else, are not engaging with what you call scientific truth, is not that we aren't able to understand your posts, it's that you are not a scientist and your posts are not scientific. If you'd admit that, we might at least be able to have a conversation. But instead, when asked a question, you respond not with answers, but with problems with the question, as if we have no right to even be talking to you, as if we need to come up to some level that you are on so we can merely understand you. Lausten wrote: it's that you are not a scientist and your posts are not scientific. If you'd admit that, we might at least be able to have a conversation. ROTFLMAO, Now despite my 25 years of scientific research Lausten demands I admit I am not a scientist and then he will engage in sincere scientific discussions and quit with the non-stop personal attacks. I'd ask for Lausten's scientific credentials but it has been clear from the beginning he has none! Lausten you are not being very honest. I have provided many answers with links or citations. You just don't like my answers! Furthermore why would you ever think it is wrong to rephrase an ill-posed question??? For instance, using the old saw if I asked "Lausten do you still beat your wife", would you not be legitimately bothered by such a awful entrapping question? Boobo is a "master" of such bad questions, but you are not too far behind. 1. "Lausten do you still beat your wife" /// I have never beat my wife. 2. "Lausten demands I admit I am not a scientist." //// No need to admit what is obvious to all. Bad Jimbo. He picks the cherries for the pits. bobbo_the_Pragmatist wrote: "Lausten demands I admit I am not a scientist." //// No need to admit what is obvious to all. ROTFLMAO You guys crack me up. Such silly transparent attempts to derail any scientific discussion via non-stop ad Homs, is what keeps me coming back, just to enjoy the shear lunacy. I have never been so entertained by posters with absolutely no science background, who nonetheless try to pretend they understand the science. I swear, the only reason I keep posting here is not because I remotely expect a real debate. That ship has sailed, as that possibility has long been shown to be a statistical impossibility. I do enjoy the wild creativity by some posters who pretend they understand the science, but when shown otherwise, quickly hide behind a fabricated fake "consensus" peppered with a variety of ad hominem insults. Will Lausten and Boobos' "refutations" and "scientific" BS soon be scattered across the internet? I suspect Boobo, and others are only legends in their own minds. Last edited by Jim Steele on Thu Feb 08, 2018 12:33 am, edited 1 time in total. Jim Steele wrote: I suspect Boobo, and others are only legends in their own minds. It is amusing how quickly you project yourself onto others. "It's the consensus, Jim!" (as in James T. Kirk) another starship commander. I look forward to a day when I stop laughing at your silly anti-science ad Homs, and we can finally engage in a meaningful scientific discussion that would be enlightening for all. I see the City of Richmond is suing Shell for hiding their own studies showing AGW from 40 years ago. Why don't you take a bike ride over to City Hall and tell them how wrong they are? bobbo_the_Pragmatist wrote: I see the City of Richmond is suing Shell for hiding their own studies showing AGW from 40 years ago. Yep...pros and cons to such types of lawsuits. I mean, why shouldn't large multi-national corporations be allowed to fraudulent portray the SCIENCE of what they are doing in order to make more money for the CEO?????? You know Bad Jimbo: you just argue very, very poorly. Shell/Exxon knew/knows MUCH MORE THAN ANYONE ELSE. They EMPLOY SCIENTISTS to look into how to maximize their business........and low and behold........they report back that their business is going to overheat the world.........so they fired all those scientists and hire schills who will support the fraudulent revenue stream. FRAUDULENT....not only to the public.....but legally relevant to legal liability: fraudulently reporting the risks and benefits to the share buying owners of Big Oil. bobbo_the_Pragmatist wrote: I'm sure you see the difference. The main system of science quality control is called peer review. Nowadays, it usually takes the form of a couple of anonymous reviewing scientists having a quick check over the work of a colleague in the field. Peer review is commonly understood as painstaking re-examination by highly qualified experts in academia that acts as a real check on mistaken work. It isn’t. In the real world, peer review is often cursory and not always even knowledgeable. It might take reviewers only a morning to do. Scientific results are rarely reanalyzed and experiments are not replicated. The types of checks that would be routine in private industry are just not done. Fox News? .........Ha, ha. Well, what else? Jimbo: you've agreed before, then flip flopped. 1. As a "general rule" is there more truth in the consensus or in the minority view? 2. Do you think dissenters from The Theory of evolution should be given any credibility at all? ===> Assuming the improbable, why not? bobbo_the_Pragmatist wrote: Fox News? .........Ha, ha. Well, what else? Fox News simply posts Dr. Ridd's reply regards JCU's attempt to suppress any debate regards coral. Boobo tacitly accepts such intellectual totalitarianism, and ignores the expert's plight! But then again all Boobo's positions depend on such an artificially enforced "consensus"
You have two direct scientifically oriented questions. Of course.........you won't answer and go off on the ab hominum you so often hypocritically rail against WHILE committing that very offensive. bobbo_the_Pragmatist wrote: You have two direct scientifically oriented questions. Dont ever expect me to follow you down your twisted rabbit holes or respond to your confabulations. Pure hypocrisy..................... and .................. weak. bobbo_the_Pragmatist wrote: Pure hypocrisy..................... and .................. weak. ROTFLMAO. Boobo engages in nonstop insults, then demands I respond to his demands that I answer whatever confabulation he constructs and follow him down his rabbit holes. "97% agree" is "one of the most famous statistics in all of science" only if you get your "science" from TV and the internet. 97% of climate scientists agree on something. We've discussed Doran and Zimmerman's survey which kicked off the "97%" meme. Here's how 97% of climate scientists answer the relevant survey questions. Neither answer, nor a combination of the two, contradicts Steele's point in the OP. The Doran/Zimmerman "consensus" does not imply that climate change over the past 50 years was caused "largely or entirely by human activity" or "mostly by human activity" or even "more or less equally by human activity and natural events". "Significant contributing factor" implies none of these statements, even regarding "changing mean global temperatures" (the subject of Doran's survey) much less "climate change" more generally (the subject of the survey that Steele cites). Even someone answering "largely or entirely by natural events" could have answered yes to Doran's second question, because "significant" in a scientific context doesn't imply a large change, only a measurable change with statistical significance. The most notorious skeptics of anthropogenic climate change, like John Christy, do answer yes, so the "97% consensus" includes practically all climate scientists, because it includes practically everyone that alarmists on TV and the internet routinely call "deniers". 97% of scientists also agree that the moon is not made of green cheese, but they don't agree that anthropogenic climate change threatens civilization in the 21st century or even that a "cap and trade", carbon trading regime is justified. Ask more specific questions, and you get more specific answers. MB: you are jumping horses midstream. The 97% number came from a SURVEY of published documents. Its just noted that 7-8 "other" surveys using other people and other techniques all came in with from 90 to 100% agreement. aka; not just one survey as you have cherry picked. But as Jimbo like to abuse: its not just one of any of the surveys: ITS THE SCIENCE that is explained by the same experts. Its not enough to find bad interpretations of ambiguous questions: you still have the science untouched. bobbo_the_Pragmatist wrote: MB: you are jumping horses midstream. The 97% number came from a SURVEY of published documents. Its just noted that 7-8 "other" surveys using other people and other techniques all came in with from 90 to 100% agreement. aka; not just one survey as you have cherry picked. The Doran survey, published in 2009, before your survey of published documents, already reported the "97%" figure. "Of these specialists, 96.2% (76 of 79) answered “risen” to question 1 and 97.4% (75 of 77) answered yes to question 2. This is in contrast to results of a recent Gallup poll that suggests that only 58% of the general public would answer yes to our question 2." This survey was widely reported, with the "97% consensus" meme, at the time. We even discussed the Doran survey in this forum before your survey of documents was published. Search the archives. "Cherry picked" is an odd description of the Doran survey, since it supports your claim. My point is that, if you look beneath the headline result, the actual data summarized are unremarkable. Despite the misstatement in the PBS video that Gord links above, 97% of the papers in the study it cites do not claim that most climate change in the last 50 years is anthropogenic. The papers make more prosaic claims supporting measurable, anthropogenic climate change. ......its not the 97% Agreement that has been cherry picked. Cherry trees have more than just cherries. ......and the SCIENCE is still untouched. That headlines of scientific papers reported on in the popular press got it wrong is not a new idea or even relevant to most issues. What is it that you "really" want to quibble about? To what end?? bobbo_the_Pragmatist wrote: ......its not the 97% Agreement that has been cherry picked. Cherry trees have more than just cherries. I never anywhere suggest that the headlines "got wrong it". I say that the headlines are prosaic and uncontroversial, because they say practically nothing about the science and say nothing at all about catastrophic consequences of climate change, anthropogenic or otherwise. If you only care about the debate between "anthropogenic CO2 has more than nothing to do with climate change" and "it's all a hoax", then you care about these headlines, but "more than nothing" is no reason to panic. Martin Brock wrote: "97% agree" is "one of the most famous statistics in all of science" only if you get your "science" from TV and the internet. Did you only mean good science with moving pictures and sound?